The search for a good online to-do list is over. I discovered mojonote.com yesterday. Pretty simple and good site. Link via Zen Habits, the site that has actually changed my life. Made me feel more responsible like. Mario, Wolf, Doom, Need for Speed…What was the first computer game you ever played? When did you first lose time consciousness to a programme? When I was about 14, my dad’s bank got computerised. Which meant that the top management send them early versions of the home computer – 286s and 386s – and my dad and a few of his colleagues were packed off to Chennai from Nagercoil to study COBOL. When dad came back, naturally he was excited. So he decided that his son – that’s me- should also be well-versed in computers. So he send me off to study BASIC in a fairly good institute. It was a three storeyed building I remember getting lost in. I did it over the summer between my eighth and ninth standards. Those guys had four games: World Space Commanders, Chess, and two games I don’t remember the name of, but let me describe them to you. In one of the games, you get a bat which was flat 2cm long thing and you had to keep hitting it on the sides of the screen. After you play a while, two balls appear in the screen and you will have to hit them. In the other one, the computer screen was a grassy surface through which you send this cylindrical eating tiny monster that eats points as it is chased by the system’s monsters. 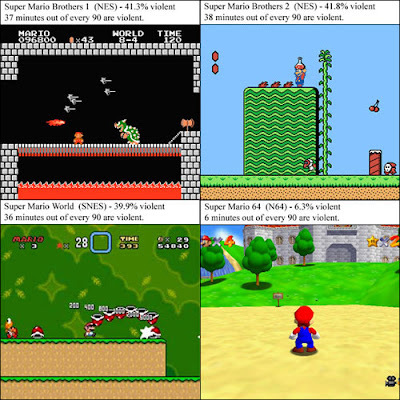 All the four games ran on MS-DOS. Nagercoil had not heard of Windows yet. I am not sure if Windows 3.1 was released by that time. I don’t remember a darn thing about BASIC anymore. But I have not forgotten anything about the games. Even today, I kinda know what keys I pressed to do what, etc. The next games were played when I went to learn windows and word at Brilliant’s Tutorials. Guys preparing for competitive exams must remember this institute as a drab place. I had fun there. Later, at the insistence of my brother, dad finally bought a run-down, assembled, second hand PC. I don’t remember what processor ran on it. But it wasn’t very fast. And Nagercoil in the mid-90s still had not heard of the Internet. By brother and I used to play Wolf on it. But the game that really we obsessed over was Doom. You may have played it. I have often wondered if that game made kids more evil than they were. Today gaming has come a long way from those early days. A couple of days ago, I was reading the two links given below. Thought I will write about what games I have played. BTW, what games do u play? Here’s a link to a Guardian blog on PS3. 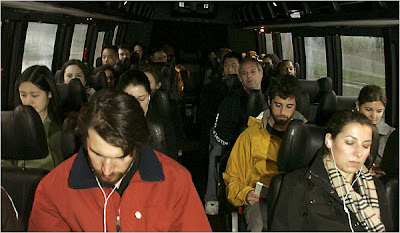 In the picture, are Googlers travelling to work on a shuttle service the company is organising for them. Read more here. Any comparisons to Sutherland should be immediately done away with. Do you think journalists like me would ever be pampered like this? Did anyone try the Yahoo Mail beta version? I am liking it. GMail recently put a fullstop to new products so that it can better develop the existing ones. They will have to do that fast now. Dictionary.com, a site I regularly use at the office, seems to have undergone a much-needed revamp. It looks more accessible and easy to use now.